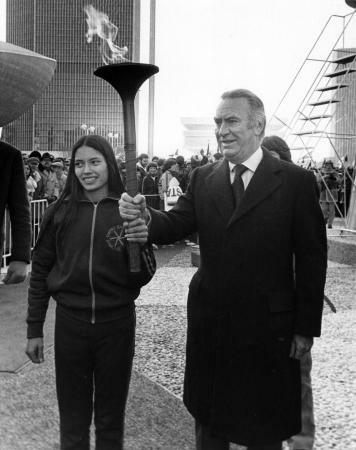 Governor Hugh L. Carey holds the Olympic Torch for the 1980 Winter Olympics, which took place in Lake Placid. ;Susan Liers (left) of Smithtown, Long Island, was an athlete in the Empire State Games. Liers used this torch to light a larger one that burned on the Empire State Plaza for the duration of the Olympic Games in Lake Placid. Source: New York State Archives. New York (State). Governor. Public information photographs, 1910-1992. Series 13703-82, Box 5, No. 80116_008.